I made a daring getaway. I only just got out of there with my life and dignity. It was at the bargain basement of Urban Outfitters. There were sales. There were $5 t-shirts. The clothing racks were spaced about six inches apart and it was the middle of the afternoon on a Saturday. Lines to the registers were 10 deep. I lasted five minutes. No amount of printed tights, patterned pants or polka dot shirts could keep me there. I scurried up the stairs and didn’t look back, for fear of being turned into stone. And to calm my nerves, I ran straight into the hardware store next door and made purchases that either make me out to be a dude or, at the very least, someone who is obsessed with coffee. 200 filters. A pour-over brewer. Batteries. I almost bought that pooping pig keychain. Remember those? Shopping is stressful and I don’t recommend it to anyone. But I do recommend a full serving of steel cut oats every morning. 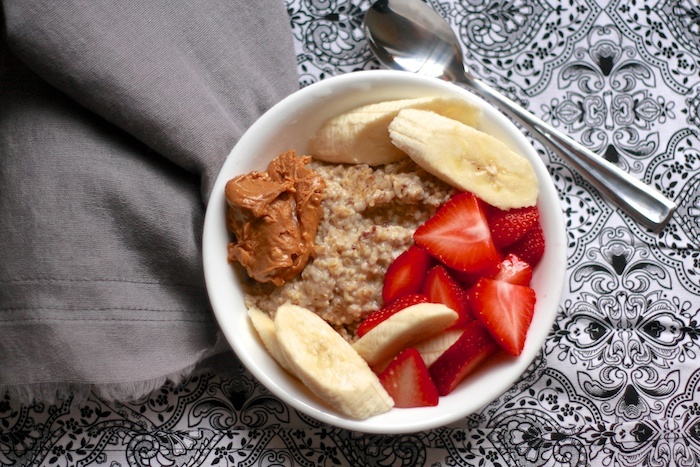 Steel cut oats are my jam. And so much better than plain old rolled oats. They’re dense and slightly crunchy and, best of all, are re-microwavable. You can make a big vat of them on Sunday and have it last you for the rest of the week. Guys I just put a tablespoon of crunchy peanut butter in that bowl. It might even be two tablespoons. A dollop. A lot. 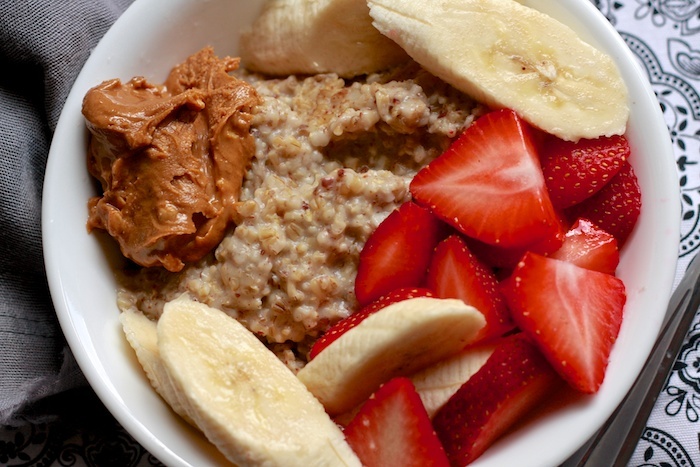 Steel cut oats with strawberries, bananas and peanut butter. In a large pot, bring the water to a rolling boil. 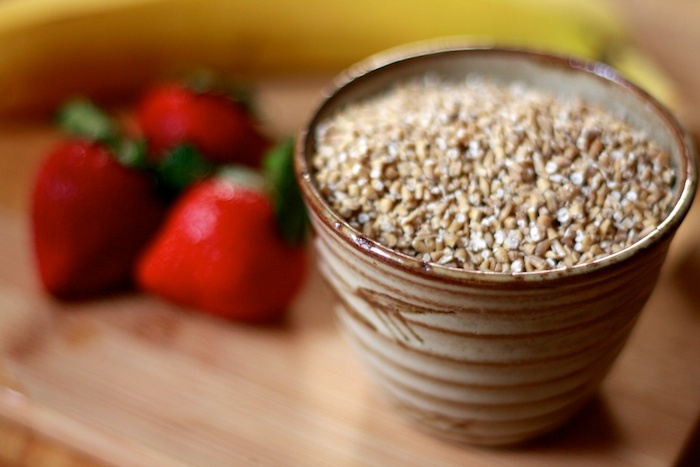 Add the oats and stir continuously to make sure none of the grains get stuck to the bottom. Reduce the heat to a simmer and keep on stirring every minute or so to prevent a skin from forming. Continue to do this for about 30 minutes, until all of the water is absorbed and the oats have a porridge-like consistency. Turn off the heat and quickly incorporate the ground flax. 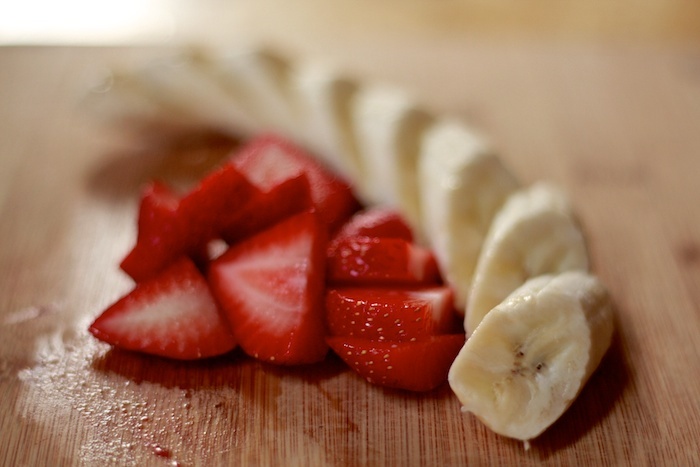 Add sliced bananas, strawberries and peanut butter dollop. You can also add any other fruit or topping your heart desires. Make it a breakfast dessert with chocolate chips. Throw in some mango. Get some jam in there. Makes enough for an apartment of 4 people or just enough to last you until Wednesday.